Bricolage is a research project involving the production of a new work by artists Nathan Thompson and Guy Ben-Ary at SymbioticA. With Bricolage, they attempt to create microscopic, autonomous, biological robots that eventually have the ability to self-assemble in the space during the exhibition duration. These biobots, or living kinetic sculptures, are derived from sources loaded with the engrained cultural associations of three main materials: blood, heart and silk. Bricolage develops these associations and explores their cultural meanings, whilst at the same time manifests the visceral behaviour of the heart muscle cells via movement. Over the past three years Guy and Nathan have developed protocols to differentiate stem cells to human heart muscle cells. One of the interesting properties of these cells is that they twitch or beat spontaneously. The artists use these twitching heart cells as actuators or bio-motors, and use their inherent movement to create self-propelled artistic biological robotic entities. IN VITRO AGENCIES comes also with a documentations of their CellF -project, the world's first neural synthesizer. If you wish to experience cellF, two concerts organised at the Heureka Science Centre March 29th and 30th. More info and tickets at the Heureka website.
" ... We have explored a wide range of organic materials to find out which could act as a body for the biobots; Silk has emerged as our choice, for its inherent cultural associations but also because its use as a biomaterial is becoming more widespread. 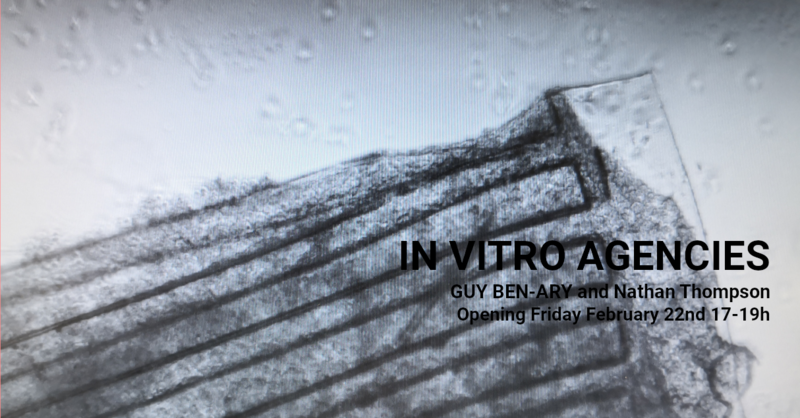 In Bricolage we are growing beating heart muscle cells over and into tiny silk scaffolds, thus creating autonomous movements of the structure - our biological Robots. The stem cells that we are using to transform into beating heart muscle cells have originated from a drop of blood. We used blood cells from human donors and reprogrammed them to become stem cells using cutting edge stem cell technologies. The three materials at play in this project are heavily loaded - blood, heart and silk – and the nature of, and relationships between, these materials is the driving force behind the project. We believe that the biological sorcery, or alchemy, that enables the conversion of a drop of blood into a living animated entity is something that needs to be explored from a cultural perspective. This is an intriguing, challenging and frankly, quite disturbing prospect. The work highlights its materiality by bringing the animated vital biological matter to the gallery, whilst confronting the viewers with the disturbing possibilities of such biological sorcery. The final version of Bricolage will include a Self-Assembly component. This is currently in development, will not be ready for the show in Solu, Helsinki. We plan to grow many tiny autonomous biobots and encourage them chemically to self- assemble when they are in proximity, to form a structure big enough that could be visible to the naked eye and without any digital mediation. We believe that only by directly engaging with the biobots can viewers sense their magic and vitality. The development of Bricolage is due to finish by the end of 2019, but we are keen to test our prototypes in field conditions outside of our labs at Symbiotica. Our biological protocols to create and sustain human heart cells in the form of a robot, are extremely complex and still unpredictable, therefore we have no real idea how successful the Solu experiment will be. Nevertheless we are excited by the possibilities and potentialities of showing work ‘under development’ and welcome the viewers to join us in our experiment to create living autonomous entities."